Adventures in Health, Food and Life. It’s time for the Week In Review and I’m freaking out. My mind is more on the coming week than the past week, but I can adjust. I have at least a week’s worth of things to do and I only have two days to do it in…I can do this. If I keep telling myself this it will happen, right?! Week in Review is hostessed by the lovely Meghan at Clean Eats, Fast Feets. Be sure to check out the other linkers when you’re finished here! Where to begin…I’ll start with the most important thing. 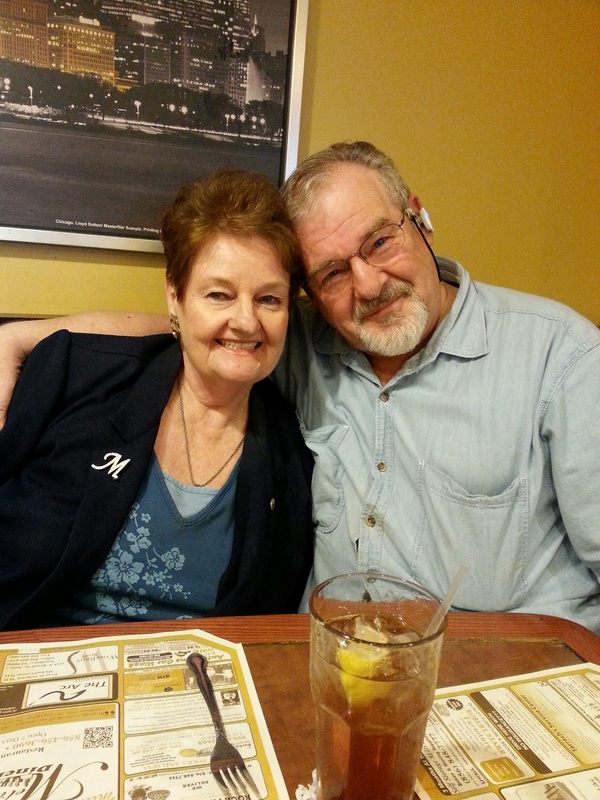 I mentioned on Friday that Ralph had a heart catheterization on Tuesday. I think we were both more anxious about the whole thing than we wanted to let each other know. When he was in the recovery area and the doctor came in, reviewed the procedure with us and said that everything was Ok, we looked at each other and confessed. We were both frightened and worried. I kissed him on the forehead, he promptly fell asleep for an hour and a half and I sat down to read. Everything was as it should be. I really can’t say enough good things about his team of doctors and Our Lady of Lourdes Hospital in Camden, NJ. He was there for his first procedure in 1997 and things have changed but only for the better. Everything was great back then, but things have only improved. They work like a well oiled machine there. A very good experience. Ok, so I’m behind in spite of all my lists and planning. Well, I’m not that far behind but Ralph is. He has a good reason but he insists on packing for himself and doesn’t like me to help. Then of course there’s the issue of things that are lost that must be found. Prior to every trip there’s something important that’s lost and can’t be found. I should start a week prior and be sure that I know where these things are. It’s always the same things. I’m working hard to be patient. I should be able to finish up most of what I need to do today (Sunday) and be ready to help Ralph as best I can. We pick up the car Monday morning and then I can start packing. I wish I could be packing a mini-van, but I’ll be packing a mid-size. Our car is always chock full of stuff on one of these trips. At least we never have to worry about picking up hitch-hikers! Ralph’s semi-monthly family lunch was on Wednesday. Of course he couldn’t go so I went in his place. It was very nice as always but everyone missed him. Ralph’s sister Maddie just wanted to see him before we left on our trip so that she could see that he was alright. 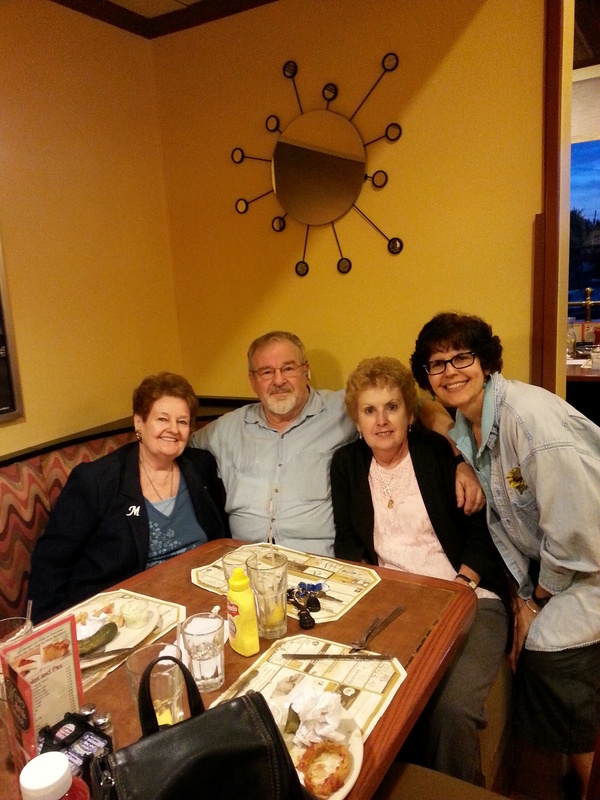 We met Maddie, her husband George and Aunt Marie for dinner at a local diner on Saturday night. Maddie, Ralph, Aunt Marie and Me. Maddie and Ralph. I love this picture. They’re so close. It’s wonderful. The next week is going to be crazy. We hope to leave on Tuesday and arrive in Nashville on Wednesday. This will very likely be my last post for the rest of the week. I don’t like doing that but, I think it only makes sense. I will still be posting on Instagram (as fabstiles) and Twitter (as BCDCFran) I think I can actually do posts from my smarter than me phone. I’m going to try that, but if you see something “odd” posted here, you’ll know it’s me struggling with the phone. That’s Week In Review for me. The next Monday we’ll be on the road again on the way to New Mexico. I’m not excited about that at all!!!!! But again, I’ll try to post something along the way. Stick with me, Cookies! I’ll be back to you soon! This entry was posted in Uncategorized and tagged road trips, Week In Review. Bookmark the permalink. fran, i just had to pop in and say that i am so glad ralph is a-ok and that last tuesday’s procedure was a success. that is wonderful! and all the best as you pack up and get ready to head out tomorrow!!! hugs!!! I’ve missed you so much, Cathy! We’re very blessed that everything went well. Please e-mail me so that we can catch up! Return Hugs!! That’s so sweet that both of you kept hushed about your concern until after the surgery! You really never know what someone else is thinking and I know from experience (well, what little I have 🙂 ) that sometimes it’s better to just say silent when things like that are going on. You never want to stress someone out or put more worries out there than necessary. I bet it was such a huge relief that it was successful though and I’m so happy to hear that Ralph’s alright! Packing. You always seem to be packing Fran! 😀 You must be an expert by now. Have fun on your trip! Thanks, Madison, we are both very happy that the procedure went so well. Very lucky too. Yes, packing is my life these days. When we get back to NJ I’ll be doing more, hopefully for the final move. Have a great day! Thanks, Liz, you’re so sweet! Ralph and I are both lucky…Have a great day! Thanks, Val! We’re glad to. Hugs to You and Mark! Glad Ralph is doing well. I went through the same experience a few years ago. The doctor said my heart was in much better shape than he expected, and nothing needed to be done. And nothing has been. Hope you have a safe trip! P.S. : I’ll check ii on Friday, after visit the doc. Thanks, Rob, We were both so happy with the results. Now to just keep him calm in general, which is never easy! Glad you didn’t need any “adjustments” when you had your procedure. Looking forward to hearing what the Dr. has to stay. Hang in there and stay in touch! Really glad the procedure went well! I can imagine how much more you will now enjoy your trip. Thanks, Ameena! It’s over until we get back to NJ. Oh, well, I can start a business after all of this!! ralph looks like he’s doing great. 🙂 i’m still so glad it went so well! have an awesome trip. i’m sure you will. it’s NEW MEXICO! It’s great so far!! Hugs! Hi! I'm Fran. Join My Adventure!